Big cuts in funding to states for coverage subsidies, Medicaid expansion and traditional Medicaid under the latest Senate Republican bill to repeal and replace the Affordable Care Act have created a political migraine for GOP senators, as Majority Leader Mitch McConnell pushes for a vote on the bill next Wednesday. Two nonpartisan analyses of the Graham-Cassidy bill show that many states represented by Republican senators would lose billions of dollars in federal healthcare funding through 2026 and far larger amounts after that. Total funding would be significantly lower than under current law. Some GOP senators from adversely affected states had voiced concerns about funding cuts and coverage losses under previous repeal bills. The newest legislation could cause even bigger cuts and coverage losses over the long term. That's led some governors and nearly all provider, insurer and patient groups to urge their senators to vote no. McConnell needs the votes of at least 50 of the 52 Senate Republicans to pass the bill under budget reconciliation rules that expire Sept. 30. No Democrats are expected to support it. The Congressional Budget Office said Monday it could not develop an estimate of the coverage and premium impact of the bill before the end of the month. But political observers say partisan pressure to fulfill the GOP's long-standing promise to repeal Obamacare could trump the senators' concerns for their states. "Political desperation to pass something goes a long way," said Tom Miller, a conservative health policy analyst at the American Enterprise Institute. The Graham-Cassidy bill, unveiled only last week, would convert the ACA's funding for premium subsidies and Medicaid expansion into $1.2 trillion in block grants through 2026. States could design their own coverage systems, with few limitations on how they could use the money. There is no provision for funding the block grants after that year. The bill also would cap and cut federal dollars to the states for traditional Medicaid, turning it into a system of per capita payments that would grow more slowly than medical inflation. An analysis by Avalere Health found that the Graham-Cassidy bill would reduce federal payments to the states for coverage subsidies, Medicaid expansion and traditional Medicaid by $215 billion through 2026 and by more than $4 trillion from 2020 to 2036. While all states would take a hit over the long term, 34 states would experience cuts from 2020 to 2026, while 16 would see a temporary boost in funding. From 2020 to 2026, California would see its federal funding reduced by $78 billion, New York by $45 billion, Maryland and Oregon by $13 billion each and Washington state by $10 billion. On the other hand, Texas would see its funding increase by $35 billion, while Alabama and Georgia each would reap $10 billion more. The Graham-Cassidy bill's formula for distributing block grants to the states initially would be based on each state's historical spending on subsidies, then would shift to other factors including the number of low-income residents as a percentage of low-income people nationally and the percentage of people enrolled in coverage. The HHS secretary also could decide how to divvy up the money among the states. "Medicaid expansion states and states that have enrolled a high number of people in insurance affordability programs would be most adversely impacted," said Elizabeth Carpenter, Avalere's senior vice president. Still, over the 2020-36 period, all states would see large federal funding reductions due to the end of funding for block grants in 2026 and the impact of the Medicaid per capita caps starting in 2020. The reductions would total $78 billion in Colorado, $120 billion in Texas, $161 billion in Ohio, $199 billion in Florida, $436 billion in New York and $800 billion in California. Looking only at the block grants, not traditional Medicaid funding, Manatt Health projected that states would receive $81.6 billion less from 2020 to 2026 than they would under current law. Twenty-nine states would see an average reduction of 19%. Between 25 and 38 states would receive less federal funding on an unadjusted basis than they get under current law, with some states seeing reductions of 50% or more to fund coverage for low-income people, Manatt said. Graham-Cassidy "is an incredibly complicated proposal, and that's why we need more time to understand what's in the bill, what it means for states in terms of funding and what it means for consumers," said Patricia Boozang, Manatt's senior managing director. "Those questions won't be adequately answered before next Wednesday." According to Avalere, states facing reductions include Alaska, Arizona and Maine, which are represented by Republican Sens. Lisa Murkowski, John McCain and Susan Collins, respectively. That trio voted no on the last GOP repeal bill in July, narrowly killing it. Now they face intensifying pressure from GOP leaders, activists and donors to support the new bill, and from healthcare industry and patient advocacy groups to reject it. 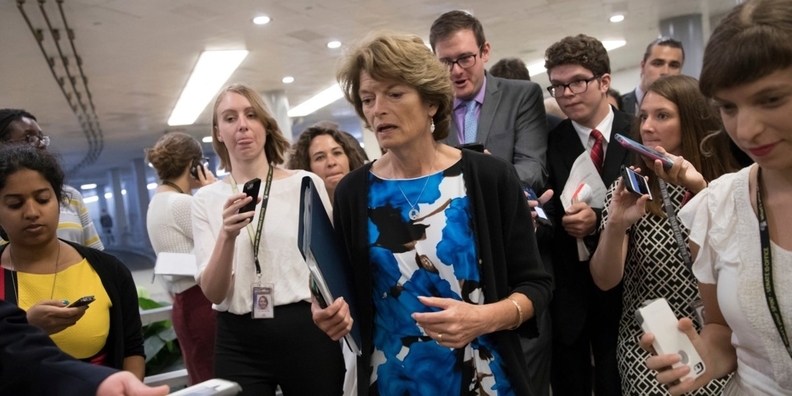 Murkowski and McCain have sent mixed signals so far. "We believe (the bill) would have damaging consequences for Alaska," said Becky Hultberg, CEO of the Alaska State Hospital and Nursing Home Association, whose state Avalere projects would lose $1 billion from 2020 to 2026. "We are concerned about the amount of money this bill cuts from the system. And developing a new healthcare plan is a heavy lift in a small state with limited administrative capacity." "We're telling Sen. Collins and the rest of Maine's congressional delegation we think it's a bad idea," said Jeff Austin, vice president for government relations at the Maine Hospital Association. His state also is projected to lose $1 billion. His organization, he added, is in "constant communications" with Collins and her staff. "This will be a very bad bill for Arizona," said Greg Vigdor, CEO of the Arizona Hospital and Healthcare Association, whose state is projected to lose $6 billion. "It's a tremendous overreach to the wrong part of the system, because our Medicaid program works pretty well." His organization and its member hospitals' CEOs are reaching out aggressively to McCain and urging him to vote no. Other states Avalere projects would see cuts include Colorado, North Dakota, Ohio and West Virginia. They are represented by Sens. Cory Gardner, John Hoeven, Rob Portman, and Shelley Moore Capito, each of whom had expressed misgiving about previous ACA repeal bills but ultimately voted yes on repeal in July. Colorado would see its federal funding cut by $6 billion from 2020 to 2026, North Dakota by $1 billion, Ohio by $9 billion and West Virginia by $1 billion, according to Avalere. Hospitals and consumer groups in those states are leaning on their GOP senators to vote no this time. Colorado Gov. John Hickenlooper and Ohio Gov. John Kasich signed a letter with eight other governors of both parties urging the Senate to reject the bill and instead work on stabilizing the individual insurance market. "These funding reductions are unsustainable for many Ohio hospitals," said John Palmer, a spokesman for the Ohio Hospital Association. Nearly 1 million Ohioans are covered either through expanded Medicaid or the ACA exchange, which has slashed uncompensated-care costs. What makes the Graham-Cassidy bill particularly unnerving for healthcare industry and patient advocacy groups is that it contains no provision for funding the block grants after 2026. Cassidy has said Congress would surely reauthorize funding. But there are widespread worries about that. "I'm not doubting Sen. Cassidy's sincerity, but if that's the goal, put it in the bill," said the Maine Hospital Association's Austin. Nervous Republican senators like Murkowski, McCain, Portman and Capito are telling reporters they're studying how the Graham-Cassidy bill would affect their state. "I'm trying to get the numbers for West Virginia," Capito told Vox last week. Now Capito and her Senate GOP colleagues—who don't plan to wait for a full CBO score of the bill before they vote—can read two independent assessments of how their states would fare. It remains to be seen how they respond.